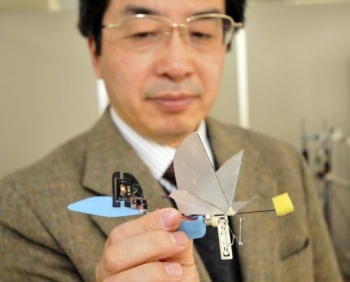 Researchers at a Japanese university have built a tiny robot hummingbird, with plans to turn it into a mobile eye. As if robot gymnasts weren't bad enough, researchers at Japan's Chiba University has built a small hummingbird-esque robot, or 'hummingbot', capable of being remote controlled. The tiny machine weighs less than three grams, is around ten centimeters long and, powered by a small motor and four wings, is more stable than a helicopter. Its creator, Hiroshi Liu, claims that building such a tiny robot is actual much harder than building a large one, and that it takes specialist knowledge that not all robot makers have. The project has cost two million dollars so far, and is likely to cost even more before it's finished. By 2011, Liu plans to equip the hummingbot with a tiny camera, ostensibly to search collapsed buildings for survivors or to hunt down criminals. Personally, I think he's in league with the robots, but that's just me.